Still waking up to the new year!? Ginnie Hart: Thank you, M 'Lady. I never get tired of windmills. Fabulous picture. Love the reflections. Ginnie Hart: I never tire of this Christmas Day tradition, MLMA. Even without snow there is so much to see each and every time. Thank you. Ginnie Hart: The nice thing about this time of the year, Lisl, is that we didn't even get out of bed till 7 a.m., and by the time we got there to see this, it was after 8 a.m. I can handle that kind of early. I wa pleasantly surprised to find it was Friday today; that week went quickly (mind you, it was just a four day week). This is a delightful view, especially the reflection. Ginnie Hart: I told Astrid that we've just finished the first week of 2016, with 51 more to go. They'll FLY when you think of it that way! Anyway, thanks, Alan. Encore une belle photo de ce moulin. Ginnie Hart: Giants tilting? Thanks for stopping by and commenting. It's a very gloomy start for a new year. Oh yeah, cos I ate too much over the holidays! You knew me too well. Ginnie Hart: Not so much gloomy as early, LC? Well, except for the eating too much, of course?! Une superbe prise : bravo ! I'm getting confused Ginnie, I always thought that it was bicycle Friday. Superb photograph you are showing today. Ginnie Hart: Boat, bicycle, windmill...take your pick, Chad. HA! And thank you. You have a purple blue hour today. A gorgeous shot for sure. Ginnie Hart: Gotta mix it up a bit, Mary, right? My favourite was Rain Friday Ginnie. Ginnie Hart: HA! But of course! 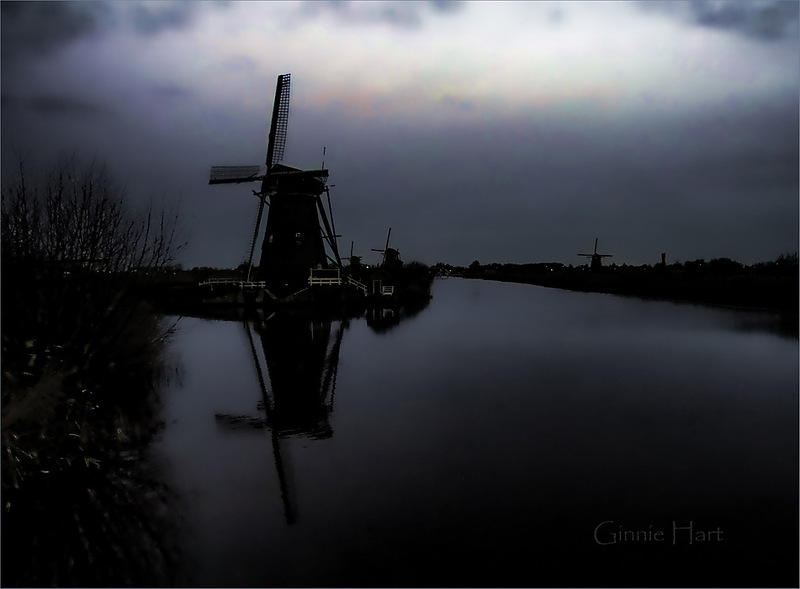 Brilliant, you've got so much atmosphere in these windmill shots Ginnie. Ginnie Hart: Thank you, Brian. Windmills are so soulful to me! Ginnie Hart: Thank you, Pat. It may be my most wonderful place on earth! Ginnie Hart: Early morning before the sun rose, Joshi...a perfect time to be there. Thanks. Ginnie Hart: That's why we love going there first thing on Christmas morning, Peter. It's our best Christmas gift that day, without a price tag! Looks like a very grey morning! Ginnie Hart: Early morning before the sun brought everything to life, Tom! Excellent ma'am. To think that one can do this with a Powershot. Your good ability shows with the total inclusion of the reflection. Ginnie Hart: I really LOVE this particular Powershot, Louis, and find it does everything I could ever want...especially with the different manipulation tools I have. I'm a very happy camper! Thanks. Such incredible tones in this, Ginnie - in the right hands (such as yours...) less is more. There's a deep peace to this image Ginnie. I like it. Ginnie Hart: For me, too, Jacquelyn. Thank you.